It’s a fantastic feeling the first time you can enjoy the freedom of driving a car on your own, but the first step to tearing up those 'L' plates is learning to drive. The first step is get a provisional driving licence, which you can apply for from the age of 15 years 9 months. However, although you can ride a moped or light quad bike from the age of 16, in most cases (and barring some special medical conditions), you can’t drive a car until you are 17 years old. You must not drive until you have received the licence. The easiest way to get a licence is to apply online, using your Government Gateway ID. If you don’t have such an ID, you will automatically get one as part of your application. As an alternative, you can apply by post, but not only does it take longer, it costs more and you have to send some original documents to prove your identity. Where can I drive as a learner? With a provisional licence – and as long as you are accompanied (see below) – you can drive anywhere, on any sort of roads, with the exception of motorways. It’s illegal for a learner to drive a car on their own, but there are strict rules on who can accompany them. When you are having a paid lesson, the instructor must be a qualified and approved driving instructor (ADI) – or a trainee – and display a badge to say they’re registered with the DVSA (Driver and Vehicle Standards Agency). This will be green if they’re qualified, and pink if they’re a trainee. Outside of lessons, you must still be accompanied, but anyone who sits with you must be qualified to drive the car you’re driving (in other words, someone licensed to drive only automatic cars can't accompany someone driving a car with a manual gearbox), be at least 21 years of age (possibly more, depending on insurance), and have had a full driving licence for at least three years. They must also sit in the front seat and be fit to drive (not drunk, for example) and, while they are accompanying you, it’s illegal for them to use a mobile phone. Yes, you can carry as many passengers as the car you’re driving is allowed to carry. What insurance do I need as a learner? This depends on whether you own the car you’re driving. If it’s your car, you’ll need your own insurance, although it’s worth noting that some insurance companies insist the person accompanying you is at least 25. If you’re in someone else’s car, their insurance should cover you, although you should check in advance that this is the case. Do I have to have official lessons? No, the government doesn’t insist that you have any number of lessons or spend any particular amount of time behind the wheel before you can take your test. However, we recommend you do have lessons with an ADI instructor, as they will be better able to teach you to pass your test thanks to a greater knowledge of what goes into the test. We also recommend these lessons are reinforced by plenty of further supervised practice. Do I have to have learner plates on the car? Yes. 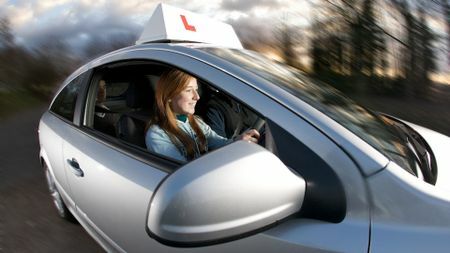 Whenever a learner is driving a car, they must display ‘L’ (or ‘D’ in Wales) plates, which are clearly visible from in front of or behind the vehicle. The letter must be red on a white background, and the plate itself must be a certain size: 178mm x 178mm, with the letter 102mm high and 89mm wide. 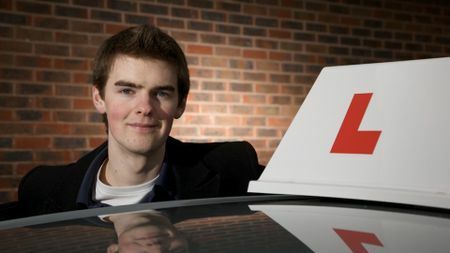 When the car is no longer being driven by a learner, the L plates must be removed or covered. The only exception to this rule is if the car is a driving school car.